And now, for the intriguingly named Kreativ Blogger Award! From the intriguingly named NoodleGirl, no less - many thanks to you for thinking of me! 4. List 7 things about yourself that people may not already know. 5. 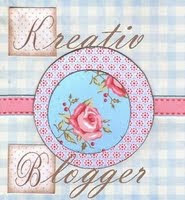 Nominate 7 new Kreativ Bloggers. 6. Post links to those 7 nominated blogs. 7. Leave a comment on each of those blogs to let the person know they've been nominated. 1. I'm persnickety about cleaning products. I don't like the fake clean smell of most of them, so I usually use the health-food store brands that don't smell like much (no matter what the label claims) or else just diluted white vinegar. I love having a cleaning person, but it drives me crazy when she uses her regular cleaners in my house - I can tell the minute I walk in that some kind of icky chemical is in the air. Sometimes I have to air out hotel rooms because of the cleaning smell. I have actually told the front desk that I have some kind of terrible lung disease and can't be exposed to chemicals, which is about the only thing that has ever worked at some hotels where I suspect the staff sprays cleaner into the air to give the room that "just cleaned" smell. I try to tip really well to make up for being complainy, though. 2. I've been going gray since college. At first it was just a few strands here and there - through my twenties I didn't really have to worry about covering it since it sort of just blended in with my highlights. But it's been getting more and more obvious for the last ten years. I finally went to a famous colorist known for creating natural tones and told her I'd do whatever she recommended. She said I don't have the right coloring for highlights and that I shouldn't "go blonde" until my hair is almost completely gray. She chose a demi-permanent dye since my hair is a light reddish brown color that doesn't cover well even with permanent color. The color did fade every few weeks, so after a few appointments she told me that she had perfected the recipe for my color and that I could just order it through the salon and do it myself at home since I didn't need the foils. It was incredibly generous of her - I obviously had to re-dye so frequently to maintain that look, and I think she genuinely just couldn't bring herself to sell me on a less attractive but more permanent dye just to keep booking me. Such a sweetie! Of course, I haven't dyed in a while now - would rather be grayish than constantly worried that I've caused some kind of irreversible damage. Which I know is overly cautious, but I can't help it. 4. I don't really like taking baths. I always feel like I have to take a shower after I get out of a bath. 5. I'm so happy that lawn is going extinct. I never liked lawn, even before it became the water-guzzling, chemical-guzzling, gas-powered-tool polluter that we see it for today. The smell of freshly cut grass makes my nose itch, and I don't like the feeling of cut blades poking my bare feet. If lawn isn't given a good edge condition it almost always has some kind of problem at the sides - adjacent planting cut by weed-whackers or runoff sinkholes in the corners. Since I often actually have to work with lawn - ironic, isn't it? - I have spent a lot of time at sod farms and ag school experimental areas. I have seen soft Kentucky grass lawns, super-tolerant Israeli grass lawns and a new, promising incredibly drought-tolerant lawn - but I still prefer native grasses that are allowed to grow to their full height, to send up their tiny flower stems and sway in the breeze. Mmm, meadow! 6. I don't like to swallow. Sorry, not even on his birthday. 7. Laundry is my favorite chore. Even more than gardening, really. Which is convenient, since we seem to do about a billion loads a week. I sort fairly specifically and then tailor my soap/softener ratio to the particular load. I listen to This American Life podcasts while I fold and iron and hang things up. Dishes, on the other hand... bleh. So, those are my seven slightly obscure tidbits of info - hope you enjoyed at least one of them! Gwynn I have a feeling she has some surprising things to say! The Babychaser Something unexpected, maybe? Midlife Mommy Usually so good about editing herself to one subject - how will she do with seven random ones? Bad Egg Just want to hear from you! Suddenly Old Eggs A little something to do while going into a new cycle? Clean Slate Wondering what you'll come up with! In other, more basic news, everything's fine. The anatomy scan was completely uneventful, things look good and I've started telling people our news. My dad and stepmother, as predicted, were delighted. I haven't got the gumption up to tell my mom yet - but only because I've been unexpectedly swamped at work and literally too tired to cope with the idea. I suppose I'll have to gather my courage and call her this week - that'll definitely be a post of it's own! These were fun! Why does this post show up as a week old...I swear it only popped up recently. Also, THANK YOU for the pic and good luck wish! I love it love it all--I posted a pic on my blog, hope that was ok. I read your #6 and clapped my hand over my gaping mouth! Too funny. I think the Se/x and the City girls had that discussion once. But I digress. Thanks for sharing the tidbits. And good luck telling your mom...I know it can be tough. Thanks so much for the this fun distraction along to me!!! I am so sorry that I checked out for a month at exactly the wrong time, but if it hasn't "expired" it will be so fun to do now!! And, I have to agree with about laundry. Soooo much better than cleaning toilets or even dusting! I am sooo embarrassed. I just read this today (1/7)! I'm so far behind, and I rely on Bloglines to help me keep track of older posts. You're right about me; it's hard to think of seven things, especially since you stole my #6 (which I would never write because my husband reads, if you know what I mean).